I have a problem -when some of my series are not active and I set the legend CheckBoxes property to be false. In this case the colors of the legends are wrong. Please, modify previous code because we can reproduce your problem exactly here. Do you have any workaround that I can use until we get the fix in future versions? I have found a workaround using GetLengeText Event and it works fine here with last version of TeeChart .Net. Please, could you check if next code works as you want? I tried to use the workaround , but it delete the legend and the colors in the chart. I couldn't reproduce your problem here using last version of TeeChart.Net. Please, could you send us a simple project, because we can see the problem here? 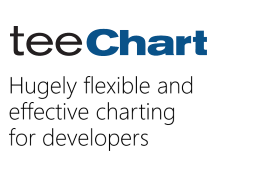 Also, could you say what version of TeeChart .Net you are using? I tried to create a small example - and it seems to work partially - since on resize of the chart - the legend begins to be corrupted. I tried to add the event and the method to our code ,and the legend looks corrupted , like the images that i send you - I think that this is related to size of the chart . I also tried to compare between the legend properties of the example and the chart in my code - and all properties were the same. GetLegenText is event that you can use basically to change text for each items of legend. I have made other example, because I found that my previous code doesn't work correctly for each case. Please, check next example works as you want. On the other hand, I recommend that update last version 3.5.3700.30574/5 you could download it in this link and check if it works as you want. Also, I have checked previous code with last version 4 of TeeChart .Net and works fine. I can not upgrade my version we are a week before code freeze. Since I didn't know to which event to link it. And I still have the same problem - I see only the checkboxes without the label. Finally, I could reproduce your problem, and I have added it in bug report list [TF02014931]. We will try to fix it for next maintenence releases of TeeChart .Net. Do you have any workaround that I can use until the fix in the future versions ? Sandra already suggested a workaround which involved using latest TeeChart for .NET v3 build available. If you can't update your TeeChart version the only solution I can think of is drawing your own custom legend as in the example Christopher Ireland posted on this thread. I'm sorry if I didn't explain myself clearly enough. As you can see here, build 3.5.3700.30574/5 is the latest version available of TeeChart for .NET v3. A TeeChart for .NET v3.5 doesn't exist, version following up TeeChart for .NET v3 is TeeChart for .NET v2010. In that case the only solution I can think of is using drawing your own legend as I told in my previous reply.